Bruce Sterling pod-interview at eTech: words are tags. Thousands of nerds gathered in San Diego last week for the annual O’Reilly Emerging Technologies conference, eTech for short. A kilt-wearing, minidisc-toting Scottish podcaster stalked Bruce Sterling in the Hyatt hallways. Eventually he convinced Bruce to sit down and opine on spimes, an “internet of things,” and the notion that in 1956, an oReilly conference description would have sounded like the best sf novel ever (stuff on screens! attention modding! Roomba cockfights!). 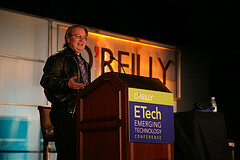 Here’s the audio: Tech Conference Show – Bruce Sterling (ETech #002) Thursday, March 9th, 2006 (MP3, 6.43 mb 9 minutes 18 seconds). Here are some photos from Scott Beale (he shot the one at left during Bruce’s talk at eTech).